Can My Computer Run Windows 7 And What Should I Do Before Upgrading To Windows 7? Windows XP, after survive in the market for a long time is known for it stability and reliability but the bad news is, it’s not a safe operating system anymore. Sound familiar? As a advanced users we also face a problem with virus, trojan, key logger, etc in Windows XP operating system even we already include and update the latest antivirus and internet security, it’s inevitable. How about Windows Vista users? Based on internet market survey many Windows Vista users don’t confident with this version of operating system and want to downgrade to Windows XP either upgrade to Windows Seven. The point is when you are ready to upgrade your system, your computer might not ready to do so. In this case you might want to check your notebook or desktop before you begin. If you are Windows XP or Windows Vista user, and you are looking forward to upgrade your operating system to the latest Windows 7 here is a few things you should do. 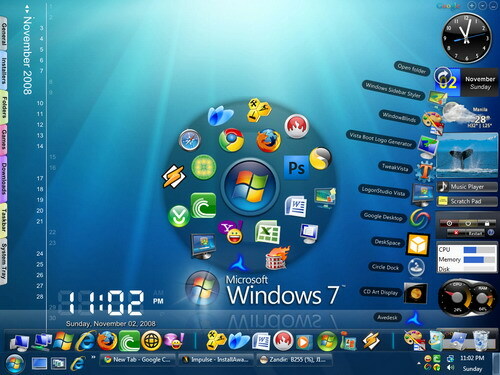 1) System Requirement – According to the Microsoft website, Windows 7 has the follow system requirements. 32-bit version: 1 GHz CPU, 1 GB RAM, 16 GB free hard disk space for install, 128 MB video RAM for Aero effects. 64-bit version: 1 GHz CPU, 2 GB RAM, 20 GB hard disk space for install, 128 MB video RAM for Aero effects. XP Mode virtualization requires adding 2 GB RAM and 15 GB of hard drive space and the correct Intel or AMD CPU that supports virtualization. 2) Drivers of your computer – Some hardware inside old computer back to Windows XP era might not provide you with the Windows 7 hardware drivers even Windows 7 is built in with most of drivers in the world. If you install before checking for you old computer hardware drivers availability, you will probably have a problem with your hardware later. For example: web-cam, sound, graphic card, modem and much more but you can choose to upgrade your old hardware to the new one. This option will allow you to change a hardware that provided Windows 7 drivers . 3) Hardware limitation – Some laptop back to few years before might able to support maximum of 1 GB while Windows 7 need 2 GB, so it’s not a good option to switch for Windows 7. 4) Software compatibility – While switching to the latest OS is a good decision, make sure you check your important software compatiblity first. As you may have some custom made software like accounting application. You have to try run it on Windows Seven before you proceed with the OS upgrade. Windows 7 does have a compatibility mode but be notice that not every software will run without error. 5) Choose between 32 bit and 64 bit – This will also help to to reduce the system requirement as 1 GB ram is require for (32-bit) or 2 GB ram is require for (64-bit), 16 GB of hard disk for (32-bit) or 20 GB for (64-bit) is required as a minimum free hard disk space. Last thing you should do is to verify with Windows 7 Upgrade Advisor at Microsoft official website or your computer shop before you make a decision. This entry was posted on Tuesday, December 15th, 2009 at 6:13 pm	and is filed under Advice and Guide. You can leave a response, or trackback from your own site. 3 Responses to "Can My Computer Run Windows 7 And What Should I Do Before Upgrading To Windows 7?" I am always looking into stuff on information that I don’t know about. It’s tough to look for things that you do not know about, because what do you search for? 😉 Your blog is right up my alley regarding something new to me. Nice share! Thanks. Thanks a lot! That was very helpful, I just bookmarked your website url.